A beautiful beach house is what dreams are made of, but the Bio-climactic House designed by Patrice Bideau brings forth design nirvana with its flurry of sustainable principles employed all throughout. 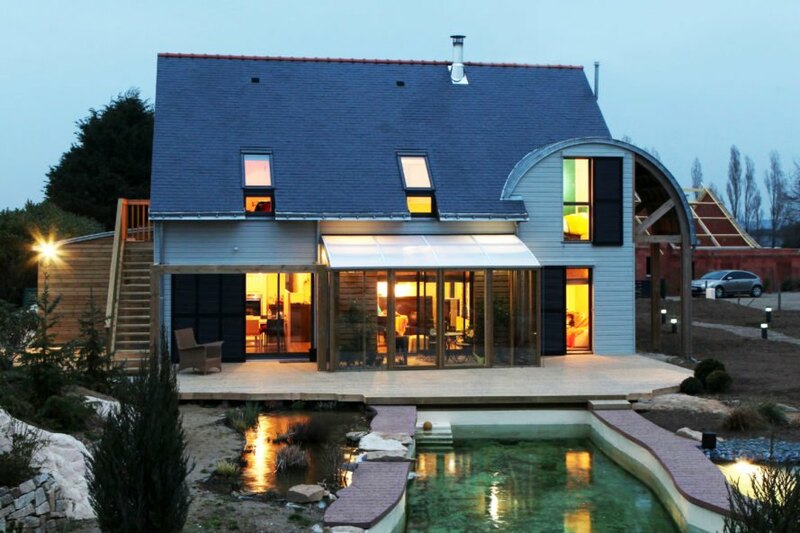 Settled on the shores of the Golfe du Morbihan, in Brittany, France, the spectacular home was built using organic architectural measures with a concentration on green energy components for maximum efficiency. Completed at the beginning of this year, the house takes advantage of the prevailing ocean winds and its beautiful site. The project was born of the owners’ desire to build a new house on their property, incorporating a landscaped garden and a natural, chemical free swimming pool. These were created before construction began on the house in collaboration with a designer and a landscape gardener. The garden was designed to provide protection from Westerly winds with a vegetable garden to the east. A distinctive ambiance emerged from this new, natural environment surrounding the construction site. 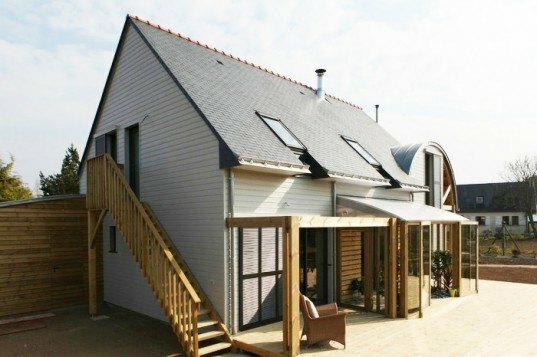 Initially, the plan was to build low-energy house using a mixture of bio-climatic concepts, wood and concrete frame, thermodynamic heating and a 5.8 kW hot water tank. The house was designed for an energy consumption of 31 kWhpe/m² per year for the heating and hot water with a hygro B (humidity regulated) ventilation system. As work progressed, plans evolved! The house was sited in the northwest section of the property in order to provide maximum space for the garden and terrace. The wood frame garage with cladding and arched zinc roof serves as a protective buffer, the canopy overhang also provides shelter for the main entrance. The walls of the house are 145/45 wood frame with 145mm Rockwool insulation standing on a concrete floor that covers crawlspace foundations composed of 200mm polystyrene slabs and a 50mm layer of extra insulation designed to limit linear thermal transfer. The combination of all these ecological elements have contributed to the elimination of the thermodynamic heating system and its replacement with back-up heating in the form of a 6 kW wood burning stove plus high performance fluid-filled radiators for an efficiency rating of between 80 and 90 kWhpe/m² per year, which conforms to the French THPE (a very high energy performance) label.